The healthcare tech industry is riding on the wave of digital transformation courtesy the increase in the use of technology in the healthcare spectrum. The advantages that technology has provided to healthcare are manifold. Technology infiltration has revolutionized the way patients are getting treated but also transformed everything from the diagnosis of a disease to care delivery and even follow-ups. Therefore, it comes as no surprise that there are a number of new companies developing new products or services which would help healthcare services provide better and more efficient care to their patients. 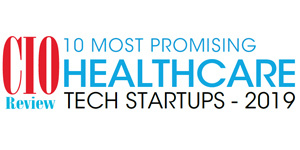 For this, these startups look to leverage the advancements in technology to proactively improve healthcare while also improving the people’s standard of living. Companies have started to tap into the power technologies such as AI, NLP, cloud, blockchain, and more to provide better care to their patients. Solutions that leverage cloud to help doctors and medical personnel consolidate the data regarding their patients have been developed so that they get a complete overview of their patients including past illnesses and other ongoing treatments. Additionally, new solutions have also been released in the market that first take into consideration the present medical conditions of the patients with chronic diseases and then come up with effective changes in their lifestyle to help them in their treatment. To help organizations select the best healthcare tech startups, CIO Review magazine has come forth with a special edition on Tech Startups. A distinguished panel of prominent CEOs, CIOs, VC’s and analysts, along with CIO Review’s editorial board has assessed a number of healthcare tech startups and has shortlisted the frontrunners in providing cutting-edge technological solutions in this space. The listing provided will help your company analyze the best solution provider that will boost your business while also helping them to serve their clients efficiently.